We haven’t decided what to call ourselves at Allard PPC. We toyed with fish huggers, maybe “oceanophiles.” Whatever the name, we are a bunch of ocean conservationists, inspired by our founder Ross, whose lifelong love affair with the ocean is contagious. We are continuously amazed at its beauty and a bit worried about its future, which is why we offer ideas on how all of us, individually and in groups, can protect and preserve our oceans. We’ve learned over the years from working with local governments and non-governmental organizations, NGOs, that there is a lot we can for the ocean, for ourselves and for future generations. The oceans are vast, but most of the deep blue is like a dessert, considering how little life there is, at least compared to the shallows where oceans meet the land. 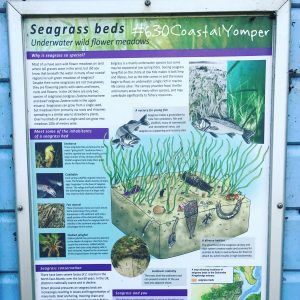 There is where you’ll find some of the richest and most productive waters on earth, oftentimes consisting of seagrass meadows. 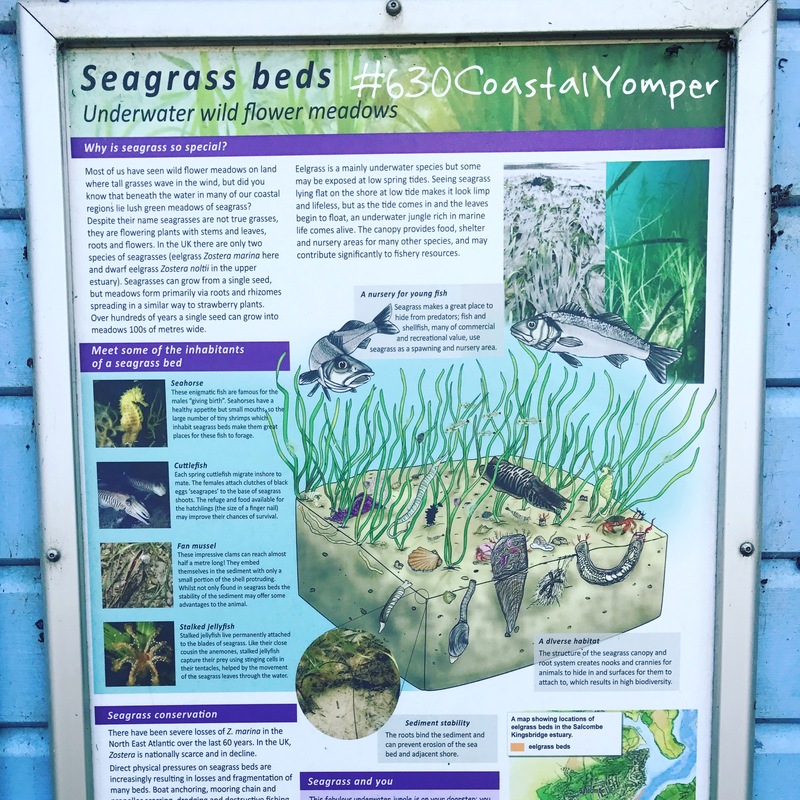 Along England’s South West Coast Path, a place of great interest to us when it comes to conservation, there are seagrass beds in the shallows (Look for our #630CoastalYomper tag for more stories about the 630-mile South West Coast Path and conservation and tourism news). These contribute massively to ocean productivity, providing important nursery habitat for shellfish and nearshore and open ocean fish. Seagrasses also anchor the seabed with their roots. Sea grasses aren’t actually grass but flowering plants. Over many years, one seed can grow into meadows hundreds of yards wide. Unfortunately, these places that are vital to ocean health are delicate ecosystems that don’t stand up well to human pressures. So we invite you to join us in committing to do what you can to protect and preserve these vital ecosystems that add so much richness to our lives. • Be Aware: If you live near the coast or along a river, be careful when applying fertilizers and pesticides to your lawn. Use only the amount of fertilizer required and consider using a slow-release fertilizer. Gutters and storm drains transport excess lawn chemicals to the water. • Know Your Boating Signs and Markers: Operate your boat in marked channels to prevent running aground and damaging your boat and seagrass beds. Know the correct side to stay on when approaching channel markers. Learn the shapes and markings of signs warning boaters of dangerous shallows and areas where boats are prohibited by law. 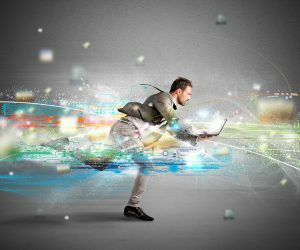 • Know Your Depth and Draft: When in doubt about the depth, slow down and idle. If you are leaving a muddy trail behind your boat, you are probably cutting seagrass. Tilt or stop your engine if necessary. If you run aground, pole or walk your boat to deeper water. Never try to motor your way out. This will cause extensive damage to seagrass and may harm your motor. • Know the times for your low and high tides. • Be On the Lookout: Docks, boathouses, and even boats can block sunlight from reaching the seagrass below. When building or repairing a dock, consider building the dock five feet above the water and using grating rather than planks. Extend the dock to deeper water so your boat does not shade seagrass. • Study Your Charts: Use navigational charts, fishing maps, or local boating guides to become familiar with waterways. These nautical charts alert you to shallow areas so you don’t run aground and damage seagrass. Meanwhile back in Florida #663CoastalYomper, Florida Gov. Rick Scott moved to close off access to the “wet sand” beach that is promised as a public asset according to the Florida Constitution. This happens while places like the South West Coast path, where access is increasing not being taken away. We think one stands in stark contrast to the other. As always, call us if you have any questions about this post or want more information on how Allard PPC can help your company or product reach its full potential.